Tony Teveris from the Woodland Farm with fresh picked stone fruits at the New Canaan Farmers Market. It’s been a tough summer for local farmers, but it’s hard to get them to complain. Too many cloudy days and way too much rain have added a layer of challenge and complexity to an already challenging and complex way of life. When you think about it, choosing farming as a career is a little crazy. After all, the two most important ingredients of your product are sun and water — and there’s no control over either. In California, they irrigate under cloudless skies on perfectly flat fields. Here, the sun and rain come and go capriciously over the notoriously rolling and rocky land. Still, there’s a rising interest in farming, as young people take to the land. According to The News-Times in Danbury, Connecticut has experienced a 15 percent increase in new farmers in the last few years. My gauge of the farming season is the tomatoes. Right after July Fourth (ridiculously early, I know) I begin looking for plump, red, vine-ripened tomatoes. This year’s pickins were slim until mid August when the sun finally came out. Now, I’m happy to say, farm market tables are stacked high with tomatoes of all colors, shapes, and sizes — juicy and flavorful. Lori Cochran, manager of the Thursday Westport Farmers Market, told me that despite the rainy weather and late start for some of the produce, the market has been busy — as good or better than last year. On a recent day, the market tables were laden with beautiful fresh produce. Under a bright blue sky with a fresh breeze off the Saugatuck River throngs of shoppers were stocking up. “It’s hard to work in the mud, everything is slow to ripen, and you can’t pick when the crops are wet,” Erica Teveris, of Woodland Farm in South Glastonbury, told me at the Westport Farmers Market. She wasn’t complaining, though, just telling it like it is, as I picked up some of her pristine peaches, sweet blueberries, and multi-colored cherry tomatoes. At the Fort Hill Farm display, you could see the seasons getting ready to change as a table of early fall potatoes and root vegetables opposed a lineup of lettuces and summer tomatoes. As I was paying for my corn, lettuce, and tomatoes, I asked how the farm had fared through the wet weeks. “In farming, there’s always something,” was the response along with a smile. As I strolled along the tents, I was impressed with the community of it all as friends connected, vendors greeted regulars, and sellers took time to explain their unique products. At the far end of the market, Laura McKinney, of Riverbank Farm in Roxbury, explained that their sandy, well-drained soil helped them to avoid the problems of too much water. “Some fall crops may be a little light,” she said, “since it was too wet to get summer seeds in the ground.” She had a stunning display of organic tomatoes, looking as though there had been no problem. Even the wettest of crops can be interrupted by too much rain. Jeanne Bloom of Copps Island Oysters said that heavy rains repeatedly closed the oyster beds this summer, cutting into days on the water. 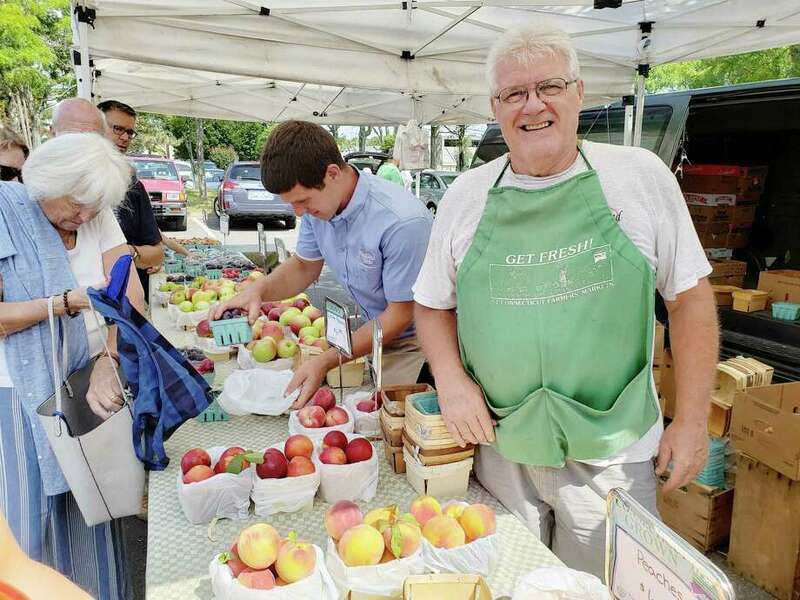 At the Saturday New Canaan Farmers Market, fourth-generation farmer Dominic Gazy, of the Gazy Brothers Farm in Oxford, said that the rain wasn’t really a surprise after three years of drought. “The zucchini is struggling, but the melons are great,” he reported. He went on to say that this spring, with its wide swings in temperature, was the toughest part of the year. So the farms and farmers are coping. You might hear the farmers griping about the weather, but don’t we all. They can use our support, though. Get what you can at your local farmers market. The season is going strong.